Venue: Our venue is a traditionally renovated mansion located in the small and picturesque village of Kamilari. This a large venue with several bedrooms, so you have the option to share a double room or stay in a private room for an additional 20€ per day. 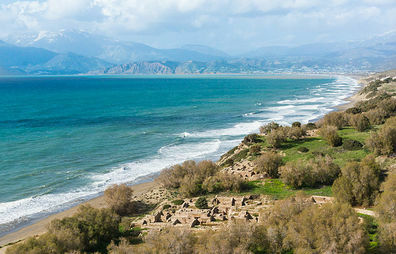 Kamilari is approximately a 75 min drive from Heraklion airport. In case you would like to extend your stay in Kamilari before or after our trip, please let us know and we can arrange it for you at a friendly rate. Day 1: We meet at 10:00 and check into our rooms. In the morning, we have a relaxed walk around the village, visiting important historical and cultural local landmarks and learning about some of the edible and medicinal plants in the area, followed by an authentic Cretan lunch prepared locally in the village. In the afternoon, we prepare herb salts from fresh herbs we have collected. You can take these home with you at the end of the trip. In the evening, we have a traditional dinner at the settlement of Eleonas around 20:30. Day 2: We leave at 9:30 to visit Rouvas forest, where we gather local wild greens and herbs. At around 13:30, we visit the village of Gergeri for a traditional Cretan lunch. After a quick stop at the venue, we spend the late afternoon relaxing, swimming and strolling on beautiful Komo beach. Following an evening rest, we start cooking the food we have gathered together at 19:00. Dinner is around 20:30. ​Day 3: In the morning, we visit the lake of Zaros and follow a stunning trail into the mountain, where we forage wild greens. We have lunch at a local restaurant that offers several foraged foods. We return to the venue at 15:00. We have a free afternoon and start cooking at 19:30 and dinner is around 21:00. Day 4: We have a relaxing breakfast before leaving the venue around 11:00. We then head to a local organic winery for wine tasting accompanied by a light lunch until 14:00. We then return to Heraklion and say au revoir. Map: The visual type? Please have a look at the map of the trip. Price: The cost for the trip is €480 per person (€560 for single room occupancy). Children aged 6-12 pay €360. This includes accommodation, transport during the trip, 3 meals a day, and guided foraging, hiking and cooking activities. Transport service can be provided from Heraklion at 8:00 on Day 1 and back to Heraklion after the end of the trip on Day 4. 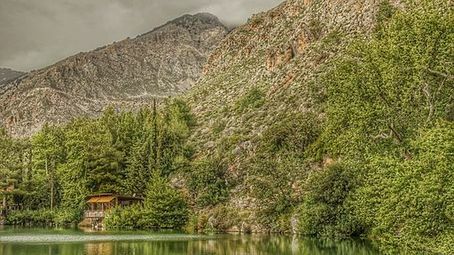 Venue: Our venue is the traditional Vamos Village, outside Chania. Depending on the number of participants, we have 1-2 shared guesthouses with 2-3 double bedrooms each. There is the option to stay in a private room for an additional 15€ per day. Vamos is approximately a 45 min drive from Chania airport. In case you would like to extend your stay at the venue before or after our trip, please let us know and we can arrange it for you at a friendly rate. ​Day 1: We meet at 10:00 and check into our rooms. In the morning, we have a relaxed walk around the village, learning about some of the edible and medicinal plants in the area, followed by a traditional Cretan lunch prepared locally in the village. 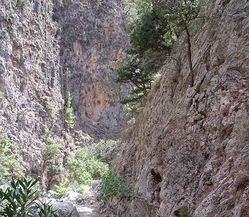 After a quick rest, we head off to forage in the surrounding area, around the Krionerida gorge. We return to the venue at 18:00, have a rest, and start cooking our foraged foods together at 19:00. Dinner is around 20:30. Day 2: We leave at 9:00 to visit the stunning gorge of Agia Irini for an extended foraging trip in Cretan nature, where we gather local wild greens and herbs. We have lunch at a restaurant and return to the venue around 17:00. Following a rest, we start cooking the food we have gathered together at 19:00. Dinner is around 20:30. ​Day 3: Ιn the morning, we collect aromatic plants from the local area and then spend the late morning on a secluded beach. Lunch is at a local taverna by the beach. After a rest at the venue, we take a workshop on how to make sustainable soap from used olive oil and herbs we have collected on our morning trip. Then we have dinner at one of the local restaurants in the village. Day 4: We have a relaxing breakfast before leaving the venue around 11:00. We then head to a local organic winery for wine tasting accompanied by a light lunch until 14:00. We then return to Chania and say au revoir. Transport service can be provided from Chania at 8:45 on Day 1 and back to Chania after the end of the trip on Day 4.